A large black and white image showing the Hanna-Barbera characters Don lent his voice to. A smaller color version of the image. 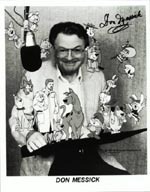 Another image presented with Don's autograph showed up on eBay, but it does not have Messick's picture, and not even necessarily images of the characters whose voices he provided, but simply a generic collection of characters representing the cartoons he was involved in. An image of part of this poster showing an autograph signed by Doug Wildey during a comic book convention in Erie, Pa., in 1986 for Gary Karpinski. 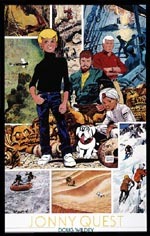 This poster was used to promote the upcoming comic book series from Comico, as well as the new Jonny Quest show (the infamous "second season"). Right above the large "ON SALE IN JUNE" letters, the poster indicates that originally the comic book series (which eventually went to 31 issues, plus a number of specials) was being planned as a 12-issue run. The series proved to be so popular, that it was held over. Unfortunately, the TV show did not do nearly as well, as was cancelled after only 13 installments. Want to make your own poster? If you have a color ink-jet or laser printer, you can download the following four files, unzip them, and print! Then match the images (there are some areas of overlap, which should make matching easier), tape or glue the images together, and...voila! Your very own poster! Using high-quality glossy photo paper produces a VERY nice result, but even plain paper will make a tolerable reproduction. Thanks to Gary Karpinski for the great scans to make this possible! The fan writes: "I assembled a single jpeg image of Doug Wildey's 'The Youngest American Hero' poster from the four separate files you so kindly provide. After placing the quadrants I cleaned-up the sharp edges (where the images overlap) and filled-in some missing border material. Some folks might be interested in a single image file of the poster, especially if they have access to a large format printer." Image specs: Dimensions: 3157 x 4400 pixels, File Size: 1.6 MB. There also is a Photoshop format file at 59 MB available. If you are interested, please write to me (Lyle), and I will put you in contact with this fan. Once you've downloaded the file, unzip and enjoy! 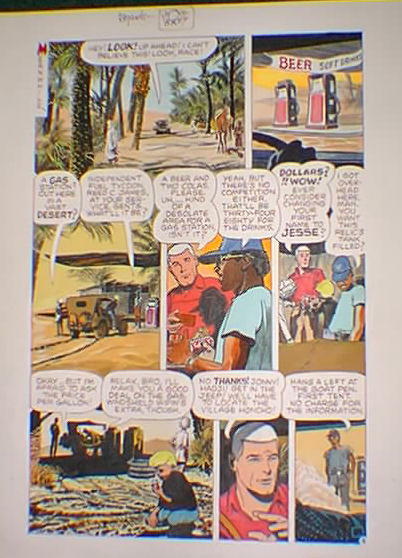 This autographed page of comic book art by the great Doug Wildey is from issue #1 of the Comico "Jonny Quest" series. Doug Wildey wrote, drew, inked, etc. 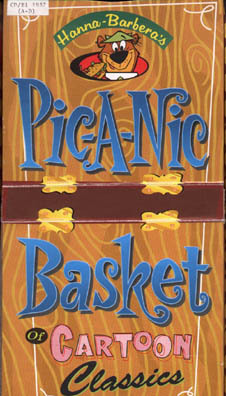 the entire first half of this comic book, as well as painting the wrap-around cover! 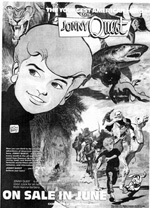 See Classic Jonny Quest comics for images and more on the comics. This 4-CD collection is the definitive gathering of musical tracks for Hanna-Barbera cartoons, containing nearly a hundred tracks of music, culled from nearly every Hanna-Barbera cartoon and animated feature ever made! It contains the only known "official" recordings of Jonny Quest themes and underscores, on volume 2 of the collection. Both the opening theme and the closing theme are present, as are about 9 minutes of underscores, which include the famous "Mummy" underscore, the "Lizard Men hydrofoil chase" underscore, and numerous other readily-recognizeable tracks. My only complaint is that not all of the underscores heard in Jonny Quest are represented; my unofficial guesstimate is about 10% of the tracks are here. 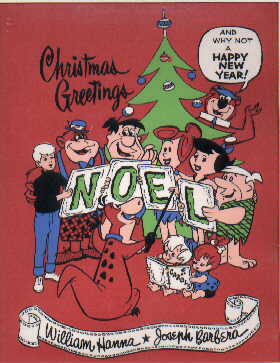 Original hand-inked and hand-painted Christmas card cel produced in the 1960s and given to the employees at Hanna-Barbera. Extremely Rare!!! image 1: card opened, showing design of front and inside. image 2: card closed, showing cut-through front with inside design showing through. 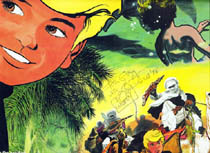 Note:Inside image is from Comico Jonny Quest comic book cover for issue #6. Black plastic lunchbox with decal images on both sides. The lunch box is dated 1995. 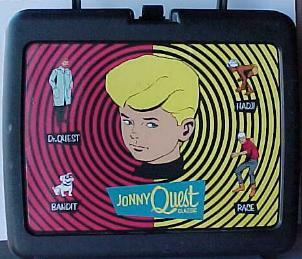 Joe Tumminelli writes: "It was interesting to finally get a glimpse of the elusive Jonny Quest lunchbox on Ebay. I knew a vintage metal-type of lunchbox does not exist (I researched it), but I was not sure of the more recent plastic variety. I thought it was nice, but I felt they could have used more interesting graphics for the front panel, given the graphic-rich legacy of the series. Nonetheless, for JQ collectors, even a plastic box can be a great item. This was the first one I have ever seen. But this plastic box at least fills a void. If any series deserves to be honored with a lunchbox, Classic JQ is at the top of the list." When I asked Joe about the "lunchbox research," he replied, "Basically, I looked through many collector's guides on lunchboxes that list boxes and their prices in hopes of finding the existence of a vintage JQ metal lunchbox. I have also visited many lunchbox specialized websites of collectors and dealers, but there has never been a mention of a JQ metal lunchbox. Thus, my depressing conclusion that this box does not exist." This 8-1/2 in. by 11 in. 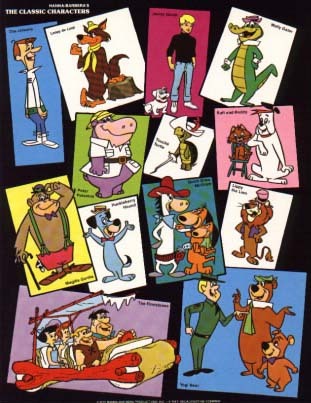 full color flyer was used to promote the Hanna Barbera library of animated cartoon series for licensing and TV syndication. It is dated 1975, and features full-color pictures of The Flintstones, The Jetsons, Yogi Bear (check out Ranger Smith's BLONDE hair!! ), Jonny Quest, Ruff & Reddy, Lippy the Lion, Quick Draw McGraw, Augie Doggy, Huckleberry Hound, Peter Potomus, Loopy de Loop, Wally Gator, Magilla Gorilla and Touche Turtle. 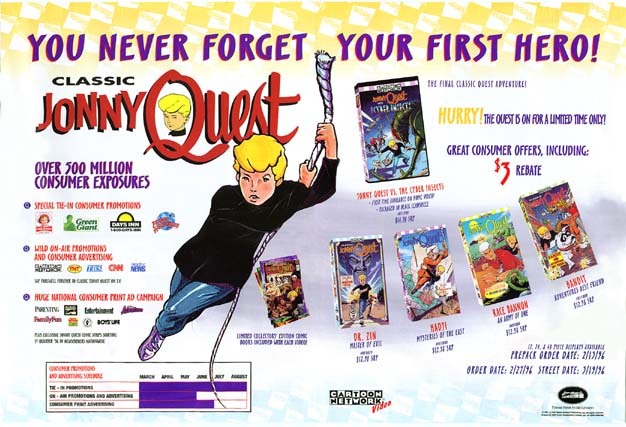 This item let video store owners everywhere know that Jonny Quest videos were on their way! This was a very big deal back in the day before the DVD season set came out, gosh, even before there were DVD players! 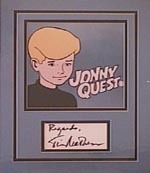 Jonny Quest videos were a much-welcomed sight for die-hard fans. Click on the picture to see a bigger version (173MB). Float action pen made by Eskesen in Denmark. Scene shows Jonny Quest with his dog and Hadji as a snake charmer; action = Jonny climbs rope. Writing on back side: "Hanna Barbera - Jonny Quest" with graphic of Jonny and Bandit's face. This pen color is blue but it was also available in white. Very similar to "floaty" pen shown above; presumed made by the same company at about the same time. Apparently a whole collection of cartoon images were placed on stickers for collecting. 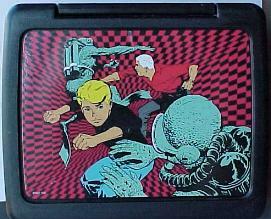 This page has the Jonny Quest sticker images. Thanks to Jim Alexander for the images! 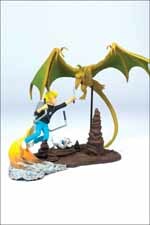 This tribute piece from McFarlane Toys shows Jonny and Bandit facing off against some kind of pterodactyl. It looks to be loosely based on the "Turu the Terrible" episode. 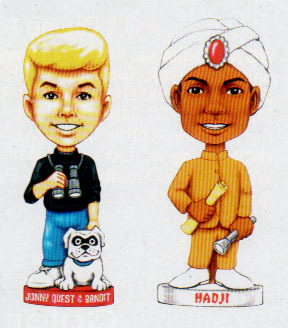 There was also a replica of this figure produced for Hallmark: the 2008 release of the Jonny Quest hand painted keepsake Christmas ornament sculpted by Nello Williams. This is how the item looked in the Hallmark catalog. These rings were reportedly produced in Argentina. We don't know much else about them. This ring appears to show Hadji from the classic series, complete with jewelled turban. The ring was found in a thrift store and appears to be a premium of some kind although if it is a premium the product association is unknown. There is a small pinhole that allows the ring to be used as a whistle. Thanks to Jeanette Vigliotti for the images! 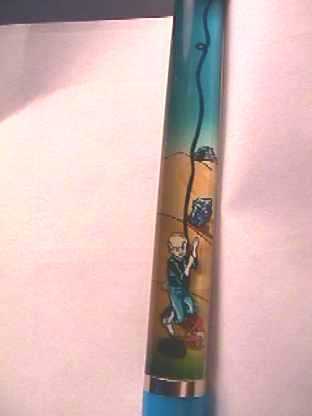 This 6 and 1/8-inch tall glass was put out by the Promotional Glass Collectors Association for their annual meeting in 2006. 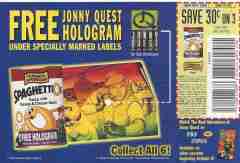 I thought you might like to see these holograms that were issued by SpaghettiO's, back in the '90s during the run of "The Real Adventures of Jonny Quest." 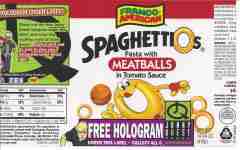 Here is a magazine ad, the can label, and 4 of the 6 holograms (I never did find the other 2, and boy, did I get tired of eating SpaghettiO's!). I'm amazed that my scanner brought out the holographic color so well. I included one other to show you what they really looked like - just colorless aluminum foil - unless you tilted them under a light source. Thanks to Susan Dundas for the images! Click on the images below to see a larger view of each.